When cranks can’t get down far enough and you can’t cover enough area with vibration baits, the best way to get slightly deep bass attention and bring them to bite on the pause is jerking. If you find yourself in that situation, then you definitely onto a big fish pattern. LAYDOWN MINNOW MID’s wide body with high floatation forceful push the water to the side to be the most appealing bait in the range. On the twitch it easily dives side to side to make you think it was a short bill lure. 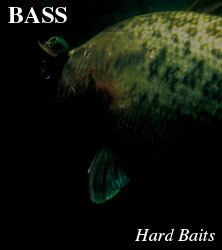 Designed to stay in the mid range which often holds big bass. MID is a jerkbait that increase your chances of catching big fish. Being a NORIES lure it has the series trademark, fluttering stop to give bass time to strike. "Casting fin" under the lip, and a unique weight balance gives the lure stability in flight increasing its castability. With 3 different sizes you can select the best lure based on the prevalent bait fish size, distant to cast and lake conditions. If it is clear or close, use a slightly "quiet" colored lure and small lure, if it is far away or muddy using a large bright colored lure will give good results. This is the lure made by the man, Norio Tanabe who took on American bass fishing with the jerking pattern. The shortest way to get that big fish pattern. This has been used in LAYDOWN MINNOW MID since 2008 and involves placing a unique weight along the back of the lure body. Normally, this would destabilize the lure and make it difficult to swim straight. However combining it with a low centre of gravity design causes the lures weight to be split between the top and bottom of the lure. This weight system makes incredibly quick action, fluttering stop and also irregular dart action possible. "flashing" appeal and up tempo strategic approach.